The poster is 59.5cm by 42cm (23 x 17 inches) - portrait. The HMSO original was published in 1939. 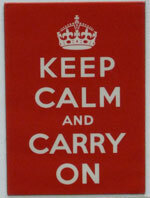 The small wording at the bottom (which can be cropped off if desired) reads 'Facsimile of original WWII poster in Barter Books, Alnwick Station, Northumberland' to distinguish it from the various unauthorised copies. 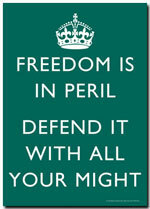 One each: 'Keep Calm', 'Your Courage', 'Freedom in Peril' poster. The posters are 59.5cm by 42cm (23 x 17 inches) - portrait. White china mug with red panels. The mug is 85mm high x 75mm diameter (3.5 x 3 inches). White ceramic with green panels. The mug is 90mm high by 75mm diameter. White ceramic with blue panels. 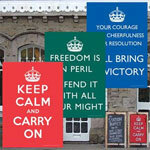 1 each 'Keep Calm', 'Your Courage' and 'Freedom in Peril' ceramic mugs. 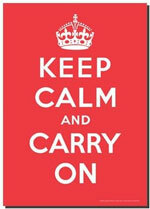 Fridge Magnet: 'Keep Calm and Carry On"
64mm (2 1/2") high, 46mm (1 3/4") wide. 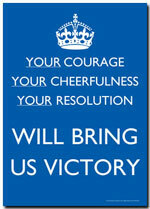 The original HMSO poster on which this fridge magnet was based was published in 1939.